A blog dedicated to Arsenal Football Club. There is absolutely nothing going on today. It’s all very quiet, I have to say. 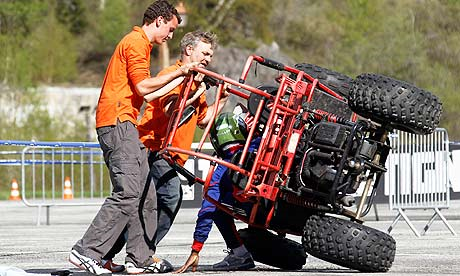 Gallas avoided further injury when he overturned a buggy during some kind of French squad bonding exercise. You do have to question the logic in having your team participate in a buggy race this close to a major tournament, but that is the wisdom of that mentalist Domenech for you. Yesterday we were linked with a Nigerian suitor who, allegedly, is considering making an offer for Lady Nina’s shares. You’d have to wonder what the logic would be to buy those shares as that would still leave him around 14% short of Kroenke Tonk Stan’s current holding of 29.9% I guess all of those emails that have been coming out of Nigeria for the last few years have been so that he can make a move for Arsenal. I think that we can put this particular story and character to one side for the time being as I would be confident that it is a bit of a non-runner. It just doesn’t make sense, to me anyway, unless he has done a deal to go into partnership with our shady Uzbeki. The Times says that there are eight potential suitors interested in buying Lady Nina’s shares, however I am taking that with a grain of salt as in the same article they also state that shares are changing hands for £10 apiece, but that Lady Nina wants £13. Given that both Kroenke and Usmanov have paid between £8,500-£10,500 per share, we can safely assume that the quoted figure is either a typo or extremely poor research. The article does point out, however, that her attempts to sell the shares may be prompted by a possible change to capital gains tax in the forthcoming emergency budget on June 22nd. Elsewhere, there are some transfer links reappearing about Melo and Schwarzer. The is also a link to Mertesacker. Whether there is any substance to these links or not remains to be seen. Schwarzer would be good for a year or two, giving Szczesny some more time to mature by getting first team experience out on loan, that’s assuming he actually makes the grade to be our no1 in the future. That’s about that for today. There’s nowt going on. The fact that I had to mention the Gallas buggy accident story shows you how slow the news is today. You are currently browsing the The North Bank - "It's got va-va-voom" (An Arsenal blog) blog archives for the day Monday, May 24th, 2010.